Purpose: Significant number of low back pain is caused by spinal instability. Clinical and radiological tests are used to diagnose lumbar instability, but the practical utility of clinical tests has not been studied extensively. Hence, it was decided to study lumbar rocking test and passive lumbar extension (PLE) clinical tests to identify their accuracy for lumbar instability, in comparison to the radiological assessment. Materials and Methods: This cross-sectional prospective study was conducted in 2017 at an Indian tertiary care center, after Ethics Committee approval. No financial transection involved anywhere at any stage of the study. Patients of 30–65 years having low back pain were included following informed consent. Clinical tests conducted were rocking test and PLE tests. All patients were subjected to a neutral anteroposterior, lateral and flexion-extension X-rays of lumbosacral spine. The association between clinical tests and lumbar instability was represented by Chi-square analysis. The rest of the findings were represented as descriptive statistics. Results: Fifty patients enrolled in the study, of which 28 (56%) were females. On X-rays, the maximum angular rotation and sagittal translation were seen at L5–S1 level. 35 (70%) and 46 (92%) patients showed positive PLE and rocking test, respectively. Significant association (P < 0.05) was seen between rocking test and lumbar instability. The sensitivity of rocking test was 95.56% and positive predictive value as 93.47%. Conclusion: Clinical tests can be used effectively for the diagnosis of lumbar spine instability. Rocking test was found to be accurate and sensitive for detecting subtle lumbar instability. Low back pain is one of the most common symptoms presented by patients, and in most of them, the structural cause is not identified. It forms a significant number of cases in spine out patient department. A striking fact is that a major number of these low back pain occur due to spinal instability. In fact, published literature mentions that 13%–30% of the total number of low back pain occurs secondary to spinal instability. Lumbar spine consists of 5 vertebrae, forming “motion segments” which are connected in series. Each of these segments contain 2 adjacent vertebral bodies and a disc as well as ligaments. It represents the smallest spine segment which exhibits bio-mechanical characteristics just like the entire spinal column. Rotation and translation can occur at every spinal motion segment. Translation ensues when a shear force leads to the parallel movement of one vertebra to the adjacent vertebra. Rotation is the spinning of one vertebra around a stationary axis caused by a torque, in relation to the adjacent vertebra. Translation and rotation ensue at each motion segment during movements of lumbar spine, in any of the fundamental body planes. For instance, lumbar flexion encompasses anterior translation and rotation, and lumbar extension includes posterior translation plus rotation of each lumbar motion segment at the sagittal level. Coordinated movements of various motion segments and absence of instability during either translational or rotational movements are needed to maintain lumbar spine stability during movements. The senior author introduced a clinical test to predict subtle instability of lumbar spine, with the patient lying in his comfortable supine position, and inducing a gentle jerk to the lumbar spine after locking hip and pelvis in hyper-flexed position by gently pushing knees onto the abdomen. Other described clinical tests such as PLE were also tested for comparison, and radiological X-ray tests were also done to verify predictability and sensitivity claimed by the test. Hence, it was decided to study the practical ability of the clinical examination tests to identify lumbar instability, in comparison to the radiological assessment. The presence of acute inflammation from any origin in lumbar spine and muscle spasm will cause pain on any movement of lumbar spine, and one will be unable to test for subtle lumbar instability. Hence, patients need to be free of any muscle spasm in spine to perform this rocking test. This assessment will help to zero down on these clinical tests, which if proved can help to be cost and time effective modality for diagnosis. This was a cross-sectional prospective study conducted between January 2017 and December 2017. All patients who presented in the outpatient clinic of a tertiary care center with complaints of chronic low back pain and were in the age group of 30–65 years were included in the study. Acute (infective/inflammatory/traumatic) low back pain of any origin with muscle spasm, history of surgery for any lumbar spine disease before was excluded from the study. The study was initiated after an Ethics Committee approval was obtained, and only those patients were included who signed the informed consent document. Considering that the sampling technique followed was period based convenient sampling technique, 50 patients were enrolled in the study. Patients were subjected to a neutral anteroposterior (AP), lateral and flexion-extension X-rays of lumbosacral (LS) spine. The clinical examination consisted of history and physical examination variables performed by one physician with 2 years of experience in orthopedics, and they were blinded to the radiographic results. History obtained included duration and distribution of symptoms, radiation of pain, claudication, prior history of low back pain, and response to previous treatments. We also assessed for midline and paraspinal tenderness. Passive lumbar extension (PLE): For the PLE test, the subject was kept in prone position; both lower extremities then were elevated concurrently to a height of about 30 cm from the bed while maintaining the knees extended and gently pulling the legs. The hypermobility derived from lumbar spinal instability would cause low back pain, and because the PLE test was associated with severe hypermobility of the lumbar region, it would lead to low back pain. The lumbar region was adjudged to be abnormal when, during elevation of both lower legs during the PLE test, the individuals complained of severe pain in the lumbar region, including “low back pain,” “very heavy feeling on the low back,” and “feeling as if the low back was coming off,” and such pain disappeared when they kept the lower limb to the initial position [Figure 2]. The disadvantage of PLE is difficulty in doing this test in obese patients. Furthermore, sacroiliac (SI) joints also can be a source of pain whereas rocking test can be carried out in any patient in his comfortable position. In PLE test, the lower extremity of the subject was elevated for 30 cm from the bed which can be variable and not standard. Radiological examination: Patients with low back pain underwent standardized AP, lateral and flexion-extension X-rays in standing position. Due to the low back pain, they were asked to move their trunk as much as they could without using special apparatus to hold the pelvis so that the effects of hip flexion were reduced [Figure 3]. Magnetic resonance imaging (MRI) scans or computed tomography scans were not included due to the cost constraint. The mean angular rotation (AR) and the sagittal translation (ST) were measured at L1–L2, L2–L3, L3–L4, L4–L5, L5–S1 spinal levels. According to the White and Panjabi criteria for instability, the diagnosis was done [Table 1]. Statistical analysis was done using Microsoft Excel and GraphPad Software, 2365 Northside Dr. Suite 560 San Diego, CA 92108. The radiographic findings were represented as mean ± standard deviation (SD) The association between the clinical tests and the lumbar instability were represented by Chi-square analysis. The rest of the findings were represented as descriptive statistics. A total of 50 patients were enrolled in the study. Of these patients, 44% of the patients were s (22 patients) while the majority, that is, 56% of the cases were females (28 cases). The mean age of the patients was 46.04 years with an SD of 6.06 years. The minimum age noticed in the study was 31 years while the maximum age was 57 years. The demographic details have been summarized in [Table 2]. The patients were assessed for spinal signs and symptoms such as radiation, claudication, tenderness, degenerative temporary scoliosis, instability catch, and root tension signs. Thirty-eight patients showed radiation, while 37 and 34 patients, respectively, showed claudication and tenderness. The least common spinal symptom was instability catch seen in 24 patients only (48%) [Figure 4]. The radiological examination is normally taken as the main diagnostic tool for stating the presence of lumbar instability. The X-ray of the patients was taken at L1–L2, L2–L3, L3–L4, L4–L5, and L5–S1 levels. The X-ray was taken in two types of positions-flexion/extension and neutral position. The parameters assessed were AR (in degrees) and ST (in percentage). [Table 3] shows the mean values of both AR and ST at different lumbar levels. 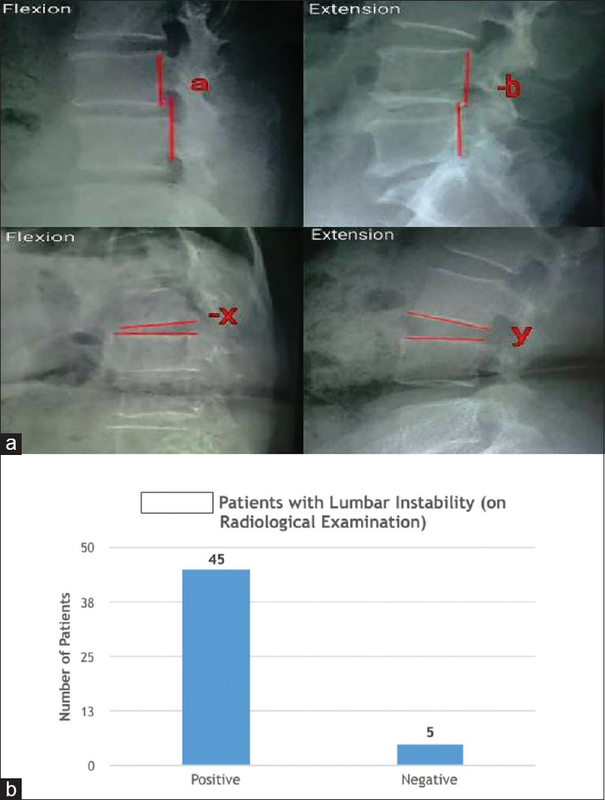 Out of all the patients, 45 patients (90%) were having lumbar instability, based on radiological investigation [Figure 5]a and [Figure 5]b. The two tests which were used for clinical examination were PLE test and rocking test. 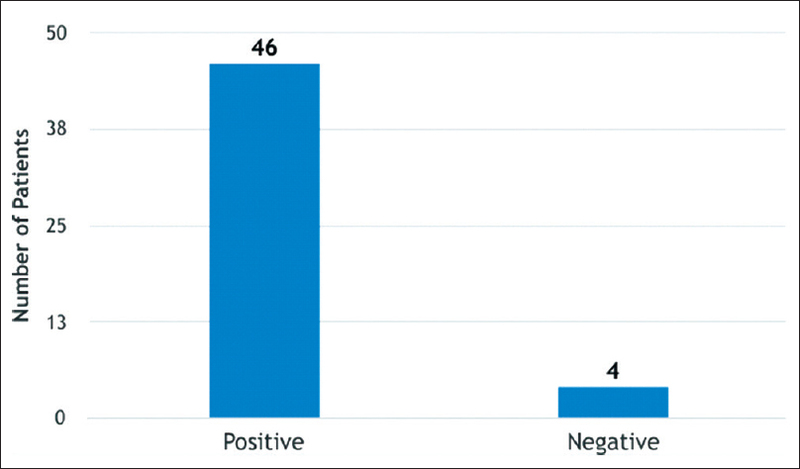 On testing, it was found that 35 out of the 50 patients (70%) had PLE test positive [Figure 6]. On Chi-square analysis, P value was 0.99 (>0.05). 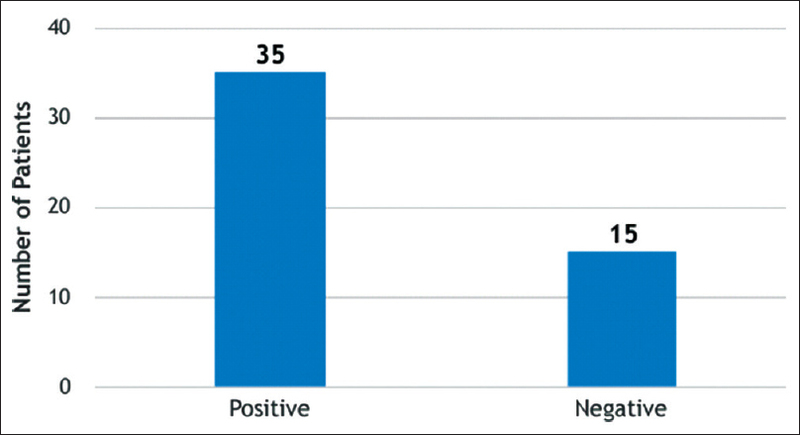 Forty-six out of the 50 patients (92%) had rocking test positive [Figure 7]. Sensitivity of rocking test: 95.56%. Specificity of rocking test: 40%. On Chi-square analysis, the association was found as P = 0.04 (<0.05), which is statistically significant. It has been projected that abnormal motion and dysfunction from structural lumbar segmental instability occur not only at end range but also during midrange spinal movements, which these tests might not identify. Flexion-extension radiographs simply assess vertebral displacement in a static way at the end-range which, hypothetically, would only notice the purpose of the inert stabilizing subsystem.,, This may have noteworthy restrictions in detecting dysfunction from structural lumbar segmental instability which occurs in the neutral zone (mid-range spinal motion). Of all the patients enrolled in this study, 90% were diagnosed with lumbar instability. On radiological examination in this study, the maximum AR and ST were seen at the L5–S1 region. This also supports the fact that clinical tests which assess and help in the finding of LS instability will be of great help in early and cost-effective diagnosis. The two clinical tests which were used were PLE test and the rocking test. Thirty-five patients (70%) in this study had a positive lumbar extension test, and 46 patients (92%) had a positive rocking test [Table 4] and [Table 5]. On Chi-square analysis, it was found that though the findings of lumbar extension test did not associate significantly (P > 0.05) with the radiological lumbar instability finding, the findings of rocking test associate significantly (P < 0.05) with the radiological lumbar instability finding. Rocking test also showed high sensitivity (95.56%) as well as high positive predictive value (93.47%). Hence, rocking test proved a strong clinical examination commodity for accurate diagnosis of lumbar instability. If a patient is unwilling to flex or extend fully from a standing position, perhaps because of pain, fear, or apprehension, both rotation and translation values will be low, even if the patient's spine can move normally. This type of guarding behavior may mask lumbar segmental instability, leading to a false-negative finding. Segmental translation and rotation, as quantitative measures of abnormal spinal kinematics, may, therefore, be confounded by simple unwillingness of the patient to move as much as he/she may be able, which would be a limitation of the methodology. There were a few limitations in the study. This study was done at one tertiary care center only more as a pilot study, but future studies can be planned in different cities at multiple orthopedic centers to know whether the accuracy is affected by the surgeon's technical variability as well. If there is no budget constraint, then these findings of the clinical tests can be compared to those seen in dynamic MRI. Nachemson AL. Advances in low-back pain. Clin Orthop Relat Res 1985;(200):266-78. Pitkänen M, Manninen HI, Lindgrer KA, Turunen M, Airaksinen O. Limited usefulness of traction-compression films in the radiographic diagnosis of lumbar spinal instability. Comparison with flexion-extension films. Spine (Phila Pa 1976) 1997;22:193-7. Panjabi MM, White AA 3rd. Basic biomechanics of the spine. Neurosurgery 1980;7:76-93. Pearcy M, Portek I, Shepherd J. Three-dimensional x-ray analysis of normal movement in the lumbar spine. Spine (Phila Pa 1976) 1984;9:294-7. Kasai Y, Morishita K, Kawakita E, Kondo T, Uchida A. A new evaluation method for lumbar spinal instability: Passive lumbar extension test. Phys Ther 2006;86:1661-7. Airaksinen O, Brox JI, Cedraschi C, Hildebrandt J, Klaber-Moffett J, Kovacs F, et al. Chapter 4. European guidelines for the management of chronic nonspecific low back pain. Eur Spine J 2006;15 Suppl 2:S192-300. Fritz JM, George S. The use of a classification approach to identify subgroups of patients with acute low back pain. Interrater reliability and short-term treatment outcomes. Spine (Phila Pa 1976) 2000;25:106-14. O'Sullivan P. Diagnosis and classification of chronic low back pain disorders: Maladaptive movement and motor control impairments as underlying mechanism. Man Ther 2005;10:242-55. Knutsson F. The instability associated with disk degeneration in the lumbar spine. Acta Radiologica 1944;25:5-6, 593-609. Shaffer WO, Spratt KF, Weinstein J, Lehmann TR, Goel V. 1990 Volvo award in clinical sciences. The consistency and accuracy of roentgenograms for measuring sagittal translation in the lumbar vertebral motion segment. An experimental model. Spine (Phila Pa 1976) 1990;15:741-50. Mulholland RC. The myth of lumbar instability: The importance of abnormal loading as a cause of low back pain. Eur Spine J 2008;17:619-25. Panjabi MM. The stabilizing system of the spine. Part II. Neutral zone and instability hypothesis. J Spinal Disord 1992;5:390-6. Friberg O. Lumbar instability: A dynamic approach by traction-compression radiography. Spine (Phila Pa 1976) 1987;12:119-29.